I have been having some fun with the new "True Gentleman" Decorative Series Paper (DSP). I thought I would make a masculine birthday card today and this is what I came up with. The base of my card is a folded half-sheet of Very Vanilla card stock. On top of that is a 3-1/2" x 4-5/8" piece of Night of Navy. Next I took a 4" x 2-3/4" piece of the "True Gentleman" DSP and taped it onto a piece of Very Vanilla that was cut 4-1/8" x 2-7/8". I set those two layers in place using Dimenisonals. 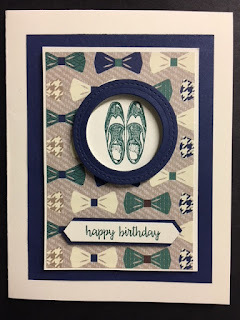 I stamped the shoes from the "Guy Greetings" set using Tranquil Tide ink and Very Vanilla card stock. I used the 1-3/4" circle punch and punched them out. For the ring, I used a stitched circle framelit and the 1-3/8" regular circle framelit. I don't know the size of the stitched framelit but it's the one that fits over the 1-3/8" circle framelit. The stitched ones have no size chart available. I will have to search the net sometime to see if I can find one. I found the circle ones on the net at www.stampwithbrian.com. I'll have to check there to see if the stitched ones are listed. I printed the other ones out and put them inside the plastic sleeve that holds the dies. I took a strip of the foam adhesive and wrapped it around the shoes image along the edge. You could get by with pieces too, it's not a shaker card so you can have openings and gaps between the pieces of tape. I just wrapped because it was easier for me. Then I hovered over the shoes and set the Night of Navy ring in place. I taped the back and set it on the DSP panel. 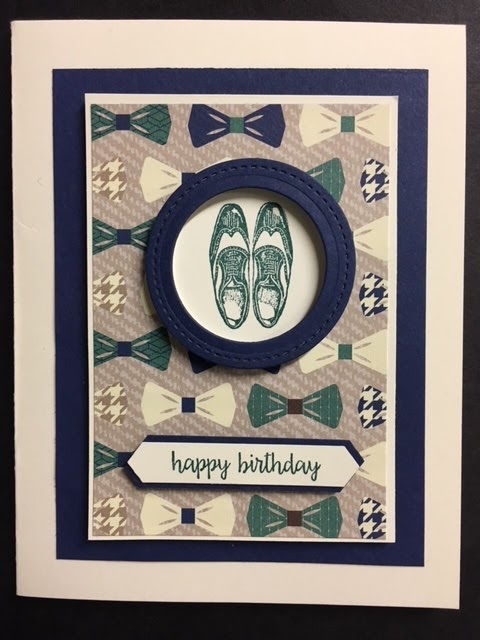 The words are from the "Happy Birthday Gorgeous" set. I stamped them using Tranquil Tide ink and I used the Classic Label punch and punched them out. I also punched two out of Night of Navy and taped them behind the word piece. I set the words in place using Dimensionals. And that is it. Super fun and simple and SO masculine!! !